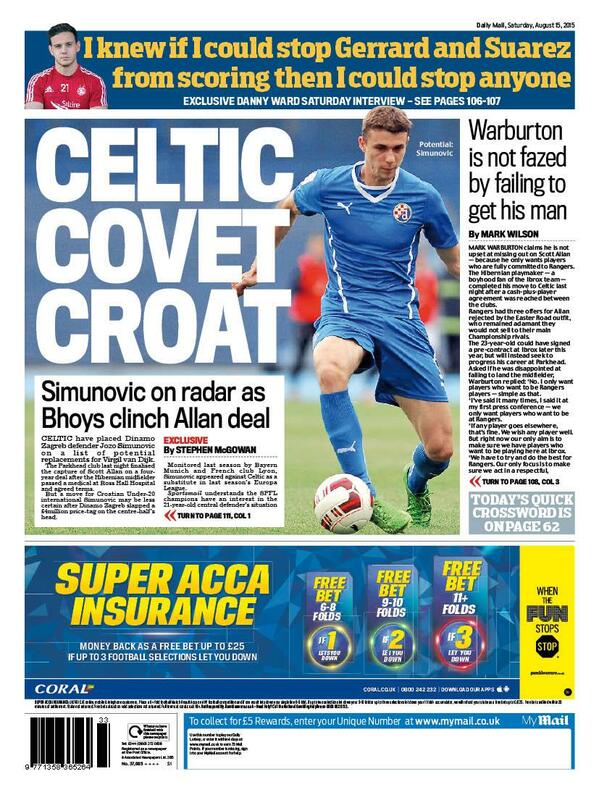 Celtic have placed Dinamo Zagreb defender Jozo Simunovic on a list of potential replacements for Virgil van Dijk. The Parkhead club on Friday night finalised the capture of Scott Allan on a four-year deal after the Hibernian midfielder passed a medical at Ross Hall Hospital and agreed terms. But a move for Croatian under-20 international Simunovic may be less certain after Dinamo Zagreb slapped a £4million price-tag on the central defender’s head. Monitored last season by Bayern Munich and French club Lyon, Simunovic appeared against Celtic as a substitute in last season’s Europa League. Sportsmail understands the SPFL champions have an interest in the 21-year-old central defender’s situation as they prepare for the likelihood of Van Dijk’s departure. As yet they have lodged no formal offer. Sounds right up our street young highly rated. Although the price is probably a bit much. Sell Ambrose for a couple million, put £2m towards this *. Then sign Mechele for £3m. Van Dijk away for £12m we sign a replacement in Mechele and another highly rated CB for £5m of that £12m. Mechele, Boyata, Simunovic and Mulgrew rotate. Job done. If he goes for Jozo on the back of his top he will be a legend. Can he play for us in Europe if he starts for Zagreb on Wednesday? Sounds the part, CB is surely the priority between now and the window closing. Almost inevitable Virgil will leave after the qualifiers even if we get to the CL. Just my opinion on it but I reckon a deal is more or less in the bag just a case of getting the qualifiers out the way. That's a good plan, tell Pistol. I'd be chuffed wi this. I reckon we will all be happy with the transfer business by the end of the window, especially after we qualify for the CL. Cus we will qualify, all due respect to Malmo. I'm pretty happy already, we should have a quality LB & CB by September 1st, that added to what we've got so far and it's actually been pretty good. And Mechele and this Jozo might join us even if, on the off chance, we have to settle for EL. It's still Euro football and were much stronger/better than last season. I think we will have a good Euro run regardless of the competition, just obviously hope it's CL. He is tall and promising CB, but he made a lot of mistakes last year and early this season, reading their press. Borussia Monchengladbach was the last club interested in him, I don't see him in Glasgow to be honest. Get Mechele and Jozo the Bozo in and I'll be happy as a pig in a hun top. Aye that would be perfect but when has this ever been the case for us in the transfer window? No doubt we will sell VVD and either not bring anyone in (with ronny thinking he can work wonders with ambrose and rotate mulgrew) or will bring in another ambrose for like 500k when really we need another 2 defenders (preferably one who can also play at left back). And if Van djik goes on deadline day i fear we will be completely shafted for Europe. There is also nothing in this story - "have placed him on a list" i.e the daily mail thinks that he would be a good replacement for van djik but celtic have never heard/inquired about him. Apparently Lawwell was in Zagreb to negotiate with Dinamo for this guy. 5 million euro offer was turned down, although I find it hard to believe we offered that. They want double. At least, that's what a dodgy google translate makes it read like. Can't see it myself but I like that it does sound as though we're trying to line up a bit of a rising star to replace Van Dijk. Dinamo "we are looking for £5 million"
Dinamo "The lowest we can go is £4,25 million"
Laweell "the lowest i can go is Efe"
Cash plus Scepovic and buy a striker. Done..